ICJ Victoria is pleased to announce that the Annual Fundraising Dinner will feature keynote speaker the Honourable Robert French AC. 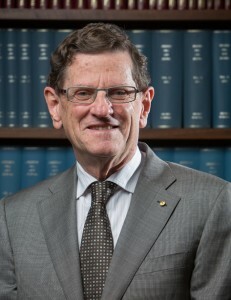 The Hon Robert French AC was Chief Justice of the High Court of Australia from September 2008 to early 2017. Prior to this, he served as Justice of the Federal Court of Australia for 22 years. His Honour’s career as a Judge was hallmarked by his commitment to blackletter law and the Rule of Law. He is renowned for his fair and rational judicial approach, and upholding the judicial oath of “decision without fear or affection, favour or ill will”. He is a members of the Board of Governors of the Asia Business Law Institute, and recently took up the role as Chancellor of the University of Western Australia. Members of the Victorian Bar can claim one CPD point for attending the dinner. If this session meets your CPD needs according to the Uniform CPD (Solicitors) Rules 2015 (available here) you may claim 1 CPD unit for each hour of attendance (breaks not included).